Want to know about all of your Fiji cruise options? Find out here on our hub Cruise Fiji section. From day cruises in Fiji to ocean liner stopovers. Reviews - What made your cruise? What better way to explore the beautiful Fiji Islands than on water. The usual length are a day or 2,3,4 or 7-night cruises. If you're already in Fiji holidaying, you have to include a cruise into your 'hectic' itinerary, as we did. Maybe somewhere in between golfing overlooking the Pacific Ocean, and your daily spa treatment (you can do your spa treatment on the cruise!). There are various itineraries offered by various companies below. The premiere overnight cruise lines of Captain Cook Cruises and Blue Lagoon Cruises offer luxury cruise-line style cruising. For relaxation, comfort, luxury and the most options, go with these. That means whether you choose a day cruise, a 7-night cruise, or anything in between you can relax and just enjoy the experience. You could expect food, non-alcoholic drinks and sometimes alcohol, snorkeling gear, and transfers to be included. Sometimes more depending on the trip, like non-motorised activities and village visits. All Yasawa and Mamanuca cruises depart from Port Denarau on Denarau Island near Nadi. Therefore most will offer free transfers to and from your resort if staying in the Nadi area. Sometimes this includes the Coral Coast. Check the Top 10 Cruise Tips below. Which Areas to Cruise Fiji? Most of the cruising options are to the stunning Yasawas and Mamanucas, the crown jewels of Fiji's tourism industry. These islands are the one's you see on postcards. Stunning corals, beautiful Fiji beaches, secluded resorts, and fantastic for snorkeling and diving. Possibly there will be additional smaller outfits with small cruise/trip/sailing operations depending on where you are staying. Check with your resort tour desk. The Mamanucas are a short distance from the departure port, so you will find the day or half-day cruises. Farther past is the Yasawas where the overnight cruises reign. Cruising to the Yasawas is a relaxing, comfortable, luxurious, mid-range to top-end priced adventure. 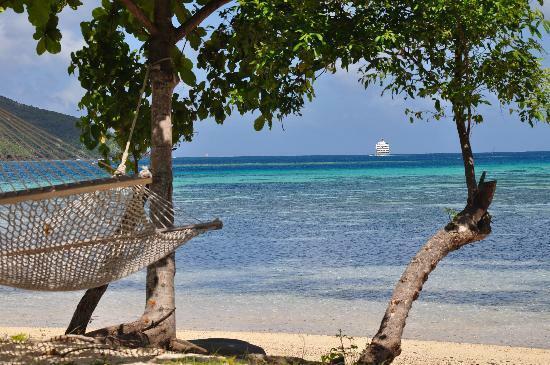 You can dive and snorkel in excellent surroundings, take village tours, pop into resorts, and of course lounge on the stunning white sanded beaches. If this sounds like you, then look no further. 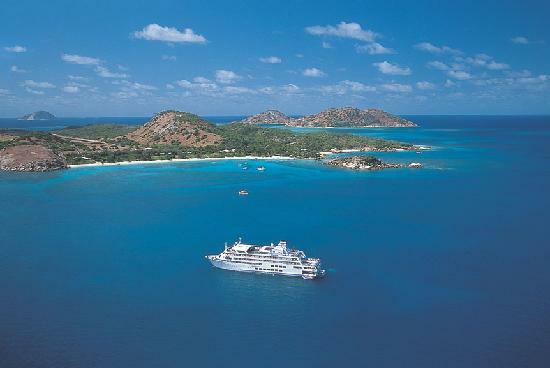 Captain Cook Cruises - has 3/4/7-night cruise options. Depending on the itinerary, it also stops at locations in the Mamanucas. The 68m cruise liner has accommodation spread over three decks plus a swimming pool, bars, and lounges. Blue Lagoon Cruises - also offers 3/4/7-night cruises. The 60m catamaran has four sun decks, a swimming pool, lounge, bar, and air-conditioned accommodation. There is also a 7-day luxury dive cruise. Awesome Adventure Fiji - offers 5 to 12-day packages which picks you up and drops you off at various spots in the Yasawas and a few in the Mamanucas. The ship is the legendary Yasawa Flyer and is the most affordable or budget option of the 3 cruises. You sleep at the resorts not on board. It island hops a total of almost 20 resorts and more than 30 islands. Savusavu has the sole port in use for yachts. This is where you will embark from if you decide to cruise around Vanua Levu. Tui Tai Adventure Cruises - is your sole Fiji cruise line option here offering 5 and 7-night cruise itineraries. It gets rave reviews and it's been described as like an intimate luxury resort on water. Lots of activities on offer, both in the water such as excellent diving and on land such as village visits. At our Fiji Cruises section, you will find details of the above cruise Fiji companies. Fancy exploring the world on water and stopping in on Fiji? Who doesn't! Waking up to a new destination each day and exploring each location's unique surroundings, culture, food and people is something quite magical. If this sounds like you, visit our Cruise to Fiji section for cruise options having Fiji as a stopover. If a Fiji sailing adventure is more your thing, here's the place. It doesn't contain information regarding bringing your own yacht to Fiji, rather sailing adventures and chartering yachts in Fiji. Are you ready to jump on board? Just before you do, check out the Top 10 Fiji Cruise Tips to make sure you are on track to make your cruise goes smoothly... just like drinking kava onboard! 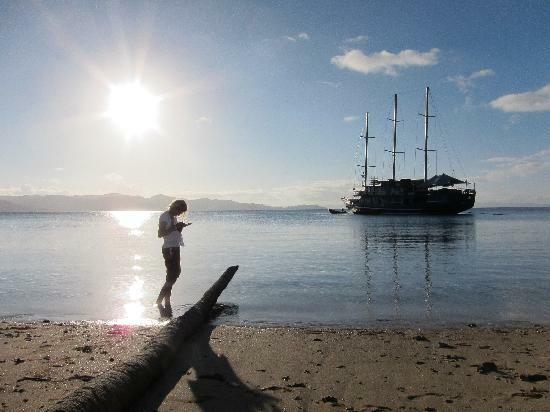 Do you have a special experience or story about you cruising around the Fijian Islands? Did someone have a bit too much Kava from the Kava ceremony and fall overboard? Do tell your on-board (or over-board) adventures!